We will do this through slowing down, playing, yoga, adventure, singing, hiking, listening, rest, eating well, inspiration, group support, connection, solo time, journey, laughter and fun. The intentionally picked location is the Tail Wind Jungle Lodge in San Pancho, Nayarit, Mexico tailwindjunglelodge.com. 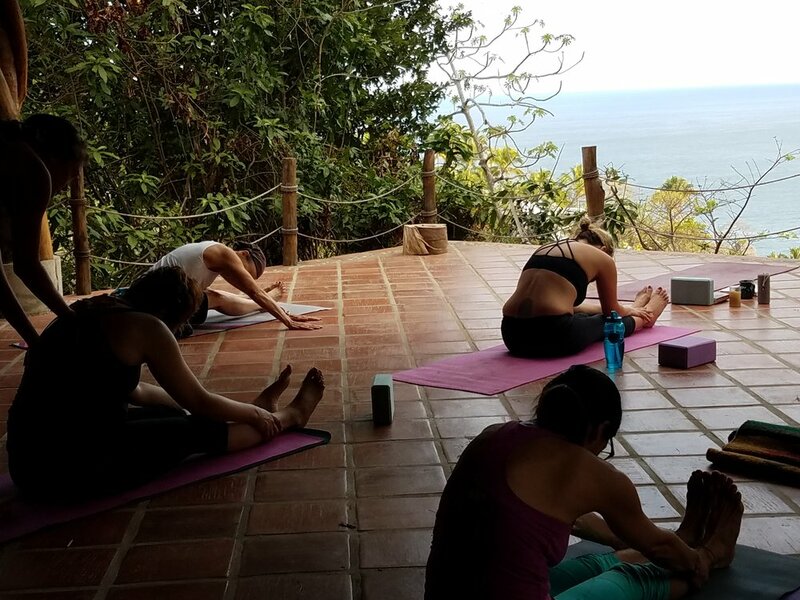 This reputable, family-owned retreat center is the perfect place to host the transition and learning offered so there will be time for rest, relaxation, activities, connecting with the group, reflecting on your own, massage and more. Wiley has been to this location annually for the past 3 years. This easy to get to magical location is the perfect match for the content of this retreat. Their website says it all, so check it out: tailwindjunglelodge.com. Noted: This is not a surf trip or a lay on the beach drinking margs to revive type trip. We have a different technique to recharge. If you do want to add this on to the start of end of your Mexico trip, I can help you with locations, surf spots, cool towns and more in this beautiful area. Sign up by March 1st and get retreat for $997 and up. Receive a planning session with me to cater retreat to YOU!!! except airfare, massage, guided water activities and alcohol (recommended to keep at a minimum at the Jungle Lodge). $250 to save your spot and you have until March 15th to complete payment. Talk to Wiley about optional payment plans. Cancellation policy: 90% refund until March 15th. 50% refund from March 15th until retreat date. If we cancel the retreat, for an unforeseen reason. You will be refunded in full. You purchase your own airfare to the easy and affordable Puerto Vallarta Airport, and we will cover the rest from there. I can help you with finding the best flights. Just think of what value this experience would be in your life? Contact me if you would like to sign up. Eva Viatkus will be joining us on the retreat as our chef. She has taken the last 10 years of her life to focus on healthy living. Eva chooses to eat gluten-free, dairy free and vegan; and does this with such style. She is a talented chef and brings such creativity into her healthy diet. She will be sharing her skills with us on the retreat. Offering chances to cook with her and learn amazing recipes to bring back home. 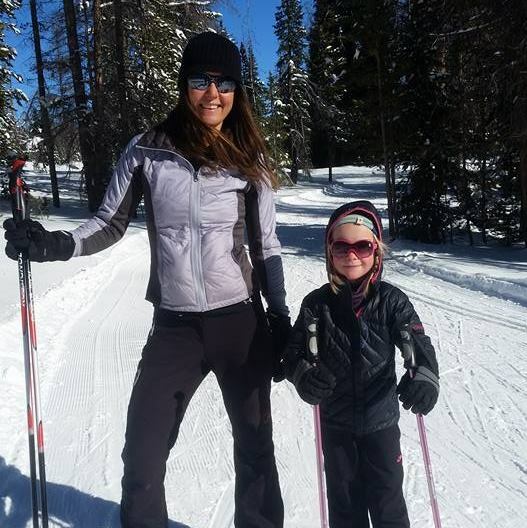 She holds passion for the outdoors and is an extreme athlete. Eva cares deeply about living a clean life and loves to help others in learning this process to integrate this into their own life. Wiley is a Certified Professional Coach who has spent the past 20 years finding passion in Outdoor Adventure travel. She instructed her first course with Outward Bound at age 21 and has been working with the school since. Wiley has traveled the world extensively, especially in Latin American countries, and even built a home in the jungle of Panama. Her daughter, now 9, was born in Panama and they annually visit their home and friends down there in the jungle. After just turning 40, Wiley is connecting to the wisdom life has provided through hard and challenging times. She takes the "what is the lesson here attitude- we have lemons, let's make lemonade." Through her divorce, co-parenting, moving and major transitions, she keeps the spirit of trust and learning alive. She loves getting intimate groups together to share in this life skills training, as well as help integrate the learning into our everyday lives. Wiley sees huge purpose and value in stepping away from daily life and routine, to reflect and learn about life with a different perspective. She studied coaching seeing the need for re-integration support after life changing situations. Wiley is active at her daughters expeditionary school and is a Certified Wilderness First Responder. She knows how to keep people safe emotionally and physically. 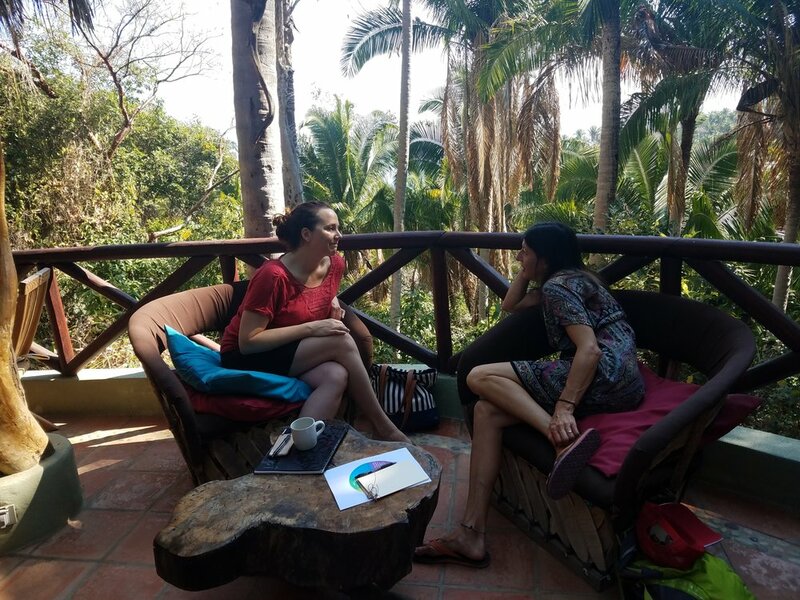 Currently, she is balancing hosting her own retreats, logistically coordinating retreats for others, coaching, being a Mama and finding play-time. Wiley especially loves skiing in Steamboat Springs where she lives, and you might find her up on a surf board down in Mexico or Panama. Brandy has been a devout student of yoga for the past 20 years, studying mainly under the Hatha and Tantric lineages. Her most influential teachers have been Aditi Devi, Sofia Diaz, Shiva Rea, and her mother Jill Eldredge. 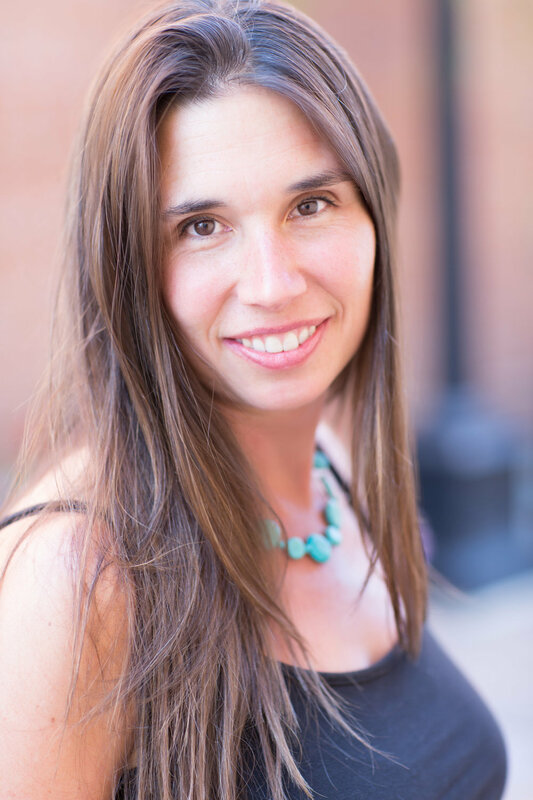 Brandy has been teaching in Central Colorado for the past 8 years; supporting students into the alignment of their spine, breath, hearts, subtle energy, and feeling sensation. In addition to teaching yoga asana, Brandy has fallen in love with her relationship to the singing bowls as the conduit between heaven and earth. She has teamed up with several yoga teachers throughout Colorado at retreats, yoga studios, and festivals to offer the experience of the permeating affects of sound and vibration. The healing vibration of sound has a calming effect on the nervous system, supporting the release of external thinkingness and bringing one's self into the inner terrain of receptivity, the state of being. Brandy has also spent the last 5 years participating in Shamanic Plant Earth based ceremonies. She is a Certified Reiki 2 Practitioner and through study now offers abdominal/womb massage within her practice. She has spent the last decade immersed in the teachings of the Feminine (for men and women). 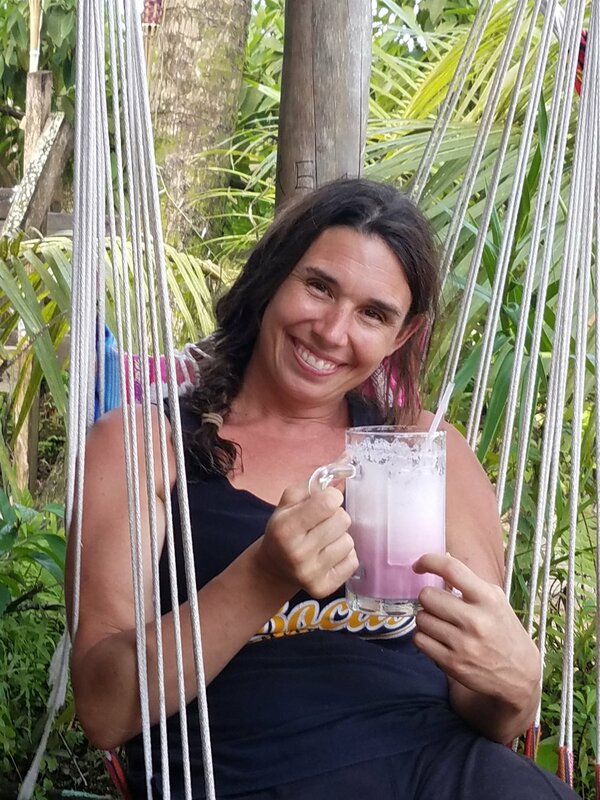 You can find Brandy teaching yoga, playing the singing bowls and offering abdominal/womb massage throughout Colorado from Salida to Denver, from Fairplay to Crested Butte. You get a flight into Puerto Vallarta arriving before 3pm on April 26th and leaving after 11 am on May 1st. Feel free to extend your stay on either end and I can help you with great places to relax in the area. On arrival, I will meet you in the airport and you will be transported to the retreat. 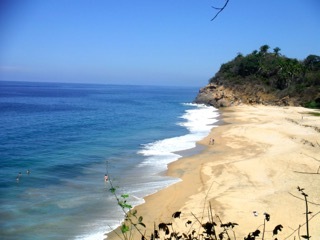 The lodge is 10 min north of the town of Sayulita, up a windy road. We will have 2 vehicles for our group, with 2 drivers. We will be leaving as a group at times, going to town, on excursions etc. Can we go spend time in Sayulita and San Pancho? Yes, we will be doing group trips down to the towns where you can explore on your own and do some shopping. We will try our best to be in Sayulita for it's Friday Farmers Market. San Pancho is closest and we will go down there for dinner one night and to watch the sunset. Do I have to do yoga and every activity offered? No, you do not have to do all activities. We want you to respect your mind and body and take time for yourself when needed. There will be a few sessions that we hope everyone can show up for as a group, we will let you know which ones, and they will be more about communication, life skills and ceremony. Can we have alcoholic drinks? We are hoping to keep drinking to an absolute minimum and do not want drinking in the main common area. You can have some drinks in your living space, yet we will ask you to wait to have a drink until you have completed the activities for the day, including the evening meditation if you so choose to join. This is not going to be a surf trip at all. I am an avid surfer myself, yet this is not on our agenda. 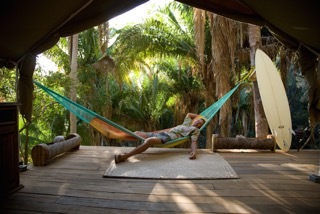 You could easily add some days on to your visit, in Sayulita and catch some waves. Discuss this with me and I have some ideas. There is limited Wi-fi when you walk up the hill to the owners house. The point of the retreat is to intentionally try to unplug from the technological world we live in. Of course, we need to contact loved ones and may need to tend to some business, so you will have access to light wi-fi use. 8:30 evening meditation on the yoga deck. The safe space with also be held by Brandy, who is a beautiful light with bountiful experience with restoration of the self. She has been teaching yoga for 8 years and will offer yoga daily at the retreat. Brandy has spent her lifetime honoring the connection of mind, body and spirit and finding her unique way to share this and bring this out in other people. Brandy also brings the gift of Abdominal Massage to this retreat. She will hold sessions on opening our awareness to this practice. Together Brandy, Eva and Wiley compliment and balance each other beautifully.